All Sociology and CJ majors should take Methods and Techniques of Social Research (920:301) in the upcoming semester if they have not already taken it.This course is a prerequisite for a number of upper-level courses, and knowledge of MicroCase and the basics of data analysis are increasingly expected in all upper-level courses. Note: the methods course also fulfills the second math requirement in the CCAS curriculum. Sociological Theory is offered only in the fall. Please plan accordingly. It is generally a good idea to focus on required courses first, leaving electives until later. Sociology majors should take Introduction to Cultural Anthropology as early along as possible, as it is a prerequisite for other required courses. Co-sponsored with the Psychology Department, Sociology’s Service Learningcourse on “Bridging the Digital Divide in Camden” will continue to combine a Wednesday late afternoon seminar with 5-6 hours of fieldwork at Camden community centers and schools. 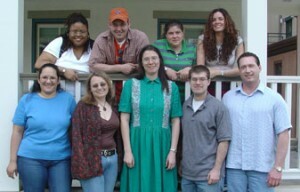 The Summer Session 2005 schedule is available online for anthropology, criminal justice, and sociology. We are offering the largest selection of summer courses ever. Taking up a challenge in Professor Wood’s Social Stratification course last spring, James Flatley and Etienne Jackson spent the fall and early spring semester creating a film to illustrate the journey down Germantown Avenue in Philadelphia, as described in Elijah Anderson’s widely-read ethnography, Code of the Street: Decency, Violence and the Moral Life of the Inner City. 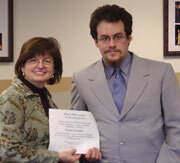 They each received a Dean’s travel award to present their work at the Eastern Sociological Society meetings in Washington DC on March 19, 2005. The well-attended session responded enthusiastically both to their film,Down Germantown Avenue: A Visual Introduction to Elijah Anderson’s Code of the Street, and to their discussion of the learning process entailed in making it. The film may be downloaded or viewed in streaming format at the film website. It will also be presented at the Undergraduate Research Poster Session on April 29th. Mark your calendars for this year’s poster session, co-sponsored by the Departments of Psychology and Sociology, Anthropology and Criminal Justice. All are invited, 12:15-1:30 in the Campus Center Multi-Purpose Room, and lunch is provided. All students are invited to bring poster presentations of research carried out during the current academic year. Students planning to make a poster presentation shouldregister online by April 22nd in order to be included in the printed program. Congratulations to Walter Kim, Katherine Paulson, and Amy Sampson who will be receiving the department’s George Masterton Award in Criminal Justice, Anthropology and Sociology respectively at the Honors Convocation on May 18th. 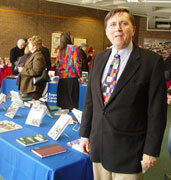 The award is named after the first chair of the department, and is given each year to students “for academic achievement, significant contributions to the University and larger communities, and intellectual promise.” Further details about the award, along with a list of past recipients, is available at the Masterton Award web page. All three recipients plan to go on to graduate study in the fall. What happens when you mix eight eager students and one multi-faceted community research project? A new class, Research Seminar in Criminal Justice (202:410). Part internship and part independent study, the class has offered student team-members the ability to participate in evaluating the Camden Safer Cities Initiative, an initiative designed to address crime in our city. The team-members have been reading extensively about crime reduction programs in other jurisdictions and have assisted in the writing of two surveys and an interview schedule for the evaluation. They have surveyed residents in Camden City about fear of crime, their attitudes toward the criminal justice system and other key factors related to the initiative. They have engaged in multiple forms of data collection and entry; one team-member even spent part of his spring break entering data on a special project looking at curfew violators (another managed to complete 25 interviews with city residents during her break). In March, Dr. Meyer and a student team-member attended the Academy of Criminal Justice Sciences meetings in Chicago to report on the initiative and its evaluation. Currently, the team-members are interviewing criminal justice and community decision-makers on the steering committee as part of the process evaluation of the initiative. Want to know their findings? Come to the Undergraduate Poster Session on April 29th, where they will be displaying posters of their findings. 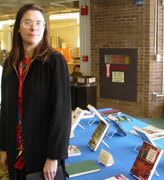 Recent books by three departmental faculty–Gail Caputo, Ted Goertzel, and Jon’a Meyer–were on display at a Paul Robeson Library display and celebration in early March. To the left, Dr. Wood poses with Paul Robeson librarian Vibiana Bowman, whose edited book on The Plagiarism Plague includes an article he wrote about the ways our web-enhanced curriculum is intended to combat plagiarism by increasing both student awareness and academic skills. Faculty, staff and students have all been expressing satisfaction with our new home at 405-7 Cooper Street, entered from the campus side through the porch shown in the picture on the left. While progress continues to be made, unfortunately the computer lab remains unfinished and the student lounge unfurnished. Our Open House celebration will probably have to wait until fall, but stay tuned just in case. Several classes have been meeting this semester in the basement seminar room. The online journal Innovate included an article about our department in its first issue by Prof. Wood, entitled “Scaling Up: From Web-Enhanced Courses to a Web-Enhanced Curriculum.“ To access it, you must register for free at the Innovate site (just unclick the box about promotions if you don’t want to receive them). It’s a good way to learn about how the department is using technology to enhance teaching and learning and what its website has to offer you. The departmental web site is organized around its Departmental Homepage and itsWeb-Enhanced Curriculum Homepage, as outlined below. If you have Windows Media Player 9 (available on all campus lab computers), you may watch and listen to a “screen movie” tour of the web site (you’ll need to bring your own headphones if you use the lab).The Department’s Web-Enhanced Curriculum was an important factor in its receipt of the Rutgers University Programmatic Excellence Award in 2003.Check it out! Familiarize youself with the resources there! Comments and suggestions welcome. October 31, 2005 . Contact Robert Wood with comments or questions. This page was printed from http://sociology.camden.rutgers.edu/news/newsletter/spring-2005-newsletter/ at 10:39 PM Thursday, April 25, 2019.